California is home to a statewide network of marine protected areas (MPAs), established to protect the integrity of marine ecosystems, rebuild depleted marine life populations, including those of economic value, and improve ocean health. 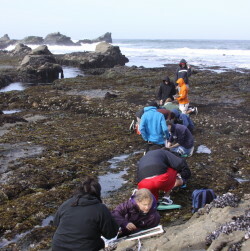 Through a novel public-private partnership, California has entrusted to the Ocean Science Trust the task of leading a collaborative effort to build and lead an MPA monitoring program that can serve the state with rigorous science into the future. The first step is to establish a benchmark of ocean conditions and human activities against which future changes can be measured. The California Ocean Protection Council has invested $16 million in baseline data collection, and we are working in partnership with the state to steward a program that delivers on this investment. In the Central Coast our collaboration with the Department of Fish and Wildlife and Fish and Game Commission established a scientific foundation for the first review of a regional MPA network. Beyond the traditional institutions of science lies a tremendous capacity on the part of non-scientists actively engaged in the world around them. We are actively working across the state to foster a citizen science community engaged in MPA monitoring, and to build understanding of the approaches and organizational arrangements that can promote enduring partnerships for ongoing monitoring. Knowledge that can advance our understanding and stewardship of ocean health is a shared goal between the state and tribal governments in California. The North Coast baseline program is the first in the state to incorporate traditional knowledge into ocean resource management. We are committed to strengthening our partnership with tribal governments throughout the state to co-produce knowledge that serves us all in ocean stewardship. Taken collectively, this statewide benchmark is unprecedented in characterizing the health of any ocean ecosystem. For California, it is a reference point from which all future conditions can be measured, including a catastrophic oil spill, impacts from climate change, as well as fishery management effectiveness, and the performance of MPAs. The value of this investment will grow to serve California far into the future.